This is Crab Daddy, Anthony’s hermit crab. We picked him up a few months ago after Anthony learned that one of his classmates had one and told him how cool they were. Well, what you see here is about all Crab Daddy does. That, and eat grapes and popcorn (the butter-flavored variety being his favorite). 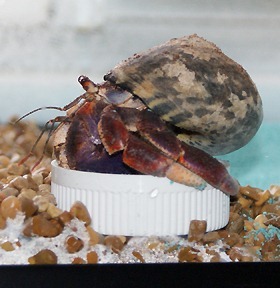 It’s a pretty easy life being a hermit crab: eat, sleep, and if you really feel adventurous, stick your head out of your shell and take a look around. He does nothing and leaves nothing in his little crab hut undone. He has no job, no credit cards, no need to know what the gas prices will be from one day to the next. There are some days when I wonder how in the Hell he can exist in not only that shell of his, but within the four glass walls of the aquarium that surround him. But then there are some days when switching lives with him wouldn’t seem like that bad of an idea.